cardigans and kids: a finished table runner and apple cake! a finished table runner and apple cake! I finished the table runner! I should have done a bit more laundry - but after a late evening at the sewing machine, I have a table runner before Autumn has left us. 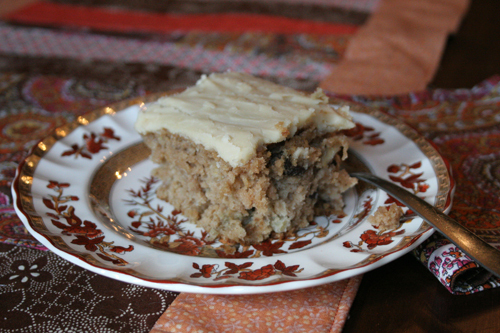 And the apple cake - well, let me confess that I have eaten it for breakfast and dessert everyday since I made it Sunday. After this recipe, I am really looking forward to the release of Scratch Baking Company's issue number 2 of "Baker's Notes". I did end up making a brown butter frosting for the top. Although, I tried a piece with just the cinnamon sugar before making the frosting and I am not sure that I would prefer one more then the other. I came up with the pattern as I went. I did try to write down measurements as I went along. I will have to go through them to see if I can make heads or tails of them. I did end up adding sew fabric from my stash for the border. It is an older Windham print (I think?) that I purchased from Purl SoHo a couple of years ago. 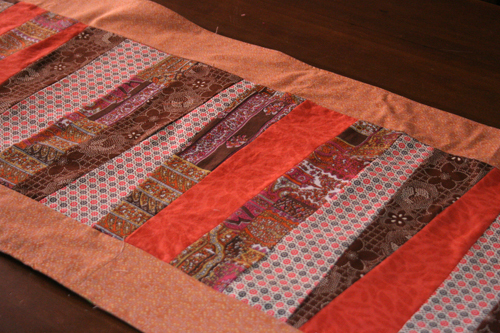 The table runner is about 90 inches long and 15 inches wide. It goes down just a bit at each end of the table lengthwise.